The meticulous accuracy of blend and tuning, skilfully combined here with rustic high-spiritendess, has created a disc as much pioneering as it is enjoyable. Finnish Baroque Orchestra's second release of Christoph Graupner's (1683-1760) music continues to reveal delightful masterpieces by the Baroque master, who during his lifetime was even more well-known than his colleague Johann Sebastian Bach. 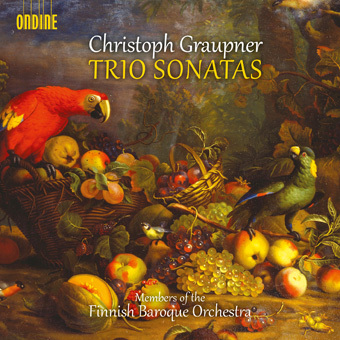 After the acclaimed release of Graupner's orchestral works (ODE 1220-2; The Finnish broadcasting company YLE Record of the Year 2013), this new album focuses on some of the chamber works by Graupner - the Trio Sonatas. Graupner was extremely productive as a composer, with a catalogue of over 2'000 works varying from orchestral works to cantatas, concertos and chamber music. He also possessed a unique personal style of writing music and often favoured certain rarer instruments in his works. Among these are the viola d'amore as well as the chalumeau, both instruments being heard also on this disc. From his contemporaries Graupner's music stands out with its exceptional command of melody and harmony.